We can provide specialised electrical power for your event. 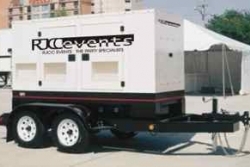 We have provided generators and mains distributions for a huge variety of events in many different situations. 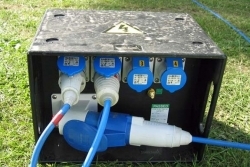 In most cases where portable power is required our clients tend to choose a generator, as opposed to using an existing household supply, so that the event equipment is completely independent. Gone are the days of unreliable noisy and smoking machines, all of our generators comply with EEC minimum noise levels and nearly all of the generators we supply are classed as 'Super Silent', meaning that they can be used in particularly noise sensitive environments. Our generators range from portable 0.84kVA (similar to those that caravans and street vendors use) to self contained 4kVA generators (usually portable on wheels like a wheel barrow! ), towable generators from 20kva to 200kva and then on to containerised vehicle based units providing up to 2000kVA. GENERATOR HIRE PRICES START FROM AS LITTLE AS £84! We also stock a variety of cables, distribution boards and rubber boxes, adapters and cable ramps which are listed in our hire section. It is not an exhausted list, we try to update it as frequently as possible, so it is quite possible that we have exactly what you're after. 20kVA GENERATOR HIRE PACKAGE TO SUIT MOST SMALL TO MEDIUM SIZED WEDDINGS AND ALL CABLES / DISTRIBUTION FOR PRIVATE PARTIES FOR CATERING, DISCO AND LIGHTING ONLY £500! Do get in touch with any questions or to discuss your specific requirements.